This week I’m introducing you all to Carissa Andrews, author of the riveting dystopian YA series, The Pendomus Chronicles. All three books; Pendomus, Polarities, and Revolutions, are available now. If you love action packed stories about strong, complicated characters fighting against impossible odds, you’ll love these books. Third—I’m being hunted by a madman who is desperately trying to wipe me from existence. Carissa Andrews is a genre-bending author who writes a combination of science fiction, fantasy, and dystopia. For 2018, she’s also venturing into the world of nonfiction to give the advice she teaches in person to her fellow authors. When not writing her own books, she’s busy reading them. Carissa’s YA scifi/fantasy/dystopian trilogy, the Pendomus Chronicles, is now available wherever books are sold. Her nonfiction book, Author Impostor, is set to release in March 2018–with more fiction works scheduled for later this year. Hello! 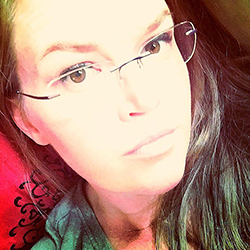 I’m Carissa Andrews—author, freelance writer, and graphic designer. 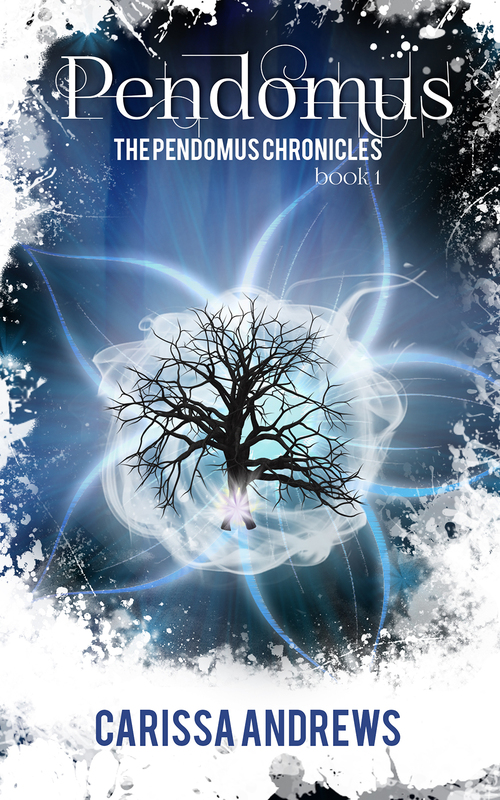 I currently have a YA/scifi/fantasy/dystopian trilogy, The Pendomus Chronicles, available on Amazon. When not writing or designing something, you’ll likely find me with my husband and our five kids. (*Gasp* Yes, I said five. Though, technically we have six, but one has her own house. HA!) I have a crazy hectic household, but luckily all the energy is conducive (most days) to keeping busy and getting stuff done. There’s no grass growing under my feet, that’s for sure. Right now, I have two current works in progress: Oracle, which is an adult urban fantasy novel about a psychic (duh!) who also happens to be immortal. Unfortunately, she’s stuck in a perpetual loop, because she can’t remember anything about her life before she turned 23 (which, coincidentally, is the apparent age she’s stuck at). It’s set to come out around June this year. The other is my first nonfiction book, called Author Impostor—which is meant to help other authors overcome impostor syndrome—and just came out March 20th, currently available on Amazon. Very young. Well before I could read I would sit for hours with picture books, making up stories about what I thought could be happening (even though my mom would read them to me and I knew their stories). This is a talent, I’ve passed on to my own daughter, who has done the same thing! My absolute favorite was the Secret Garden. I mean, who doesn’t love that book? I always wanted to find a secret world all to my self—somewhere I could go to escape when I wanted to get away from my brothers. I’ve even read it to my kids. I’m gonna have to go all cliché and say the Harry Potter series. It was the first time an author really showed me to the way people can evolve throughout a series of books. The last book I read was Six Figure Author by Chris Fox (as well as the rest of his Write Faster, Write Smarter series). My current favorite though, has to be Jennifer Armentrout’s Lux series. My BFF turned me on to the series not long ago and I can’t seem to put them down! I would love to meet JK Rowling and pick her brain. In understanding the writing process, I’m still in awe of her mind and the way she kept everything straight for the Harry Potter series. I’d love to hear more about her process and just get to know her as a person. She seems totally cool! When I was in 7th grade, I got the first inklings. I got pulled into a side class to write and illustrate my own book. I think there were about seven of us who got tapped. While I did finish my project, I didn’t overly come up with anything creative I wanted to write about. We were sorta forced to do it there on the spot without any creative brainstorming. A few weeks later, I sat down at our family’s computer and penned my first novel—a 200+ page ode-to-Fear Street novel about a girl who… wait for it… finds a secret room in a house she just moved to. HA! I do, and just told you about it. LOL! Granted, I was probably writing before then and just never gave a second thought to it… but “Never What They Seem” (yes, that was the title) was most definitely my first real story. The most difficult part of my writing journey has been finding the time to write when my life gets hectic. I have five kids in my house most days, plus my husband. The youngest is just three, so he’s constantly needing something from me, just as it should be. This usually means in order to write, I need to sneak away while someone else is in charge, so I can focus on what my characters are trying to tell me. The best part is hearing how my stories have touched a reader—or sparked their imaginations. I get told a lot how the Pendomus Chronicles has stuck with a reader for days and even weeks afterward. Love that! Done is better than perfect. A lot of authors can sit and stew in their own juice—usually for WAY too long. They want everything to be perfect, so they write and rewrite scenes over and over and over—but never end up publishing anything. The game of publishing has changed a lot, and trust me—your book out there, even if not perfect, is still better than collecting dust in your shelf or hiding somewhere on your hard drive. Well, you know about the current in-progress WIPs, but I do have more slated for 2018. I’ve been tapped to take part in a boxed set called Angels & Magic, set to come out in June of this year. I’ll be contributing a short novella, as well as a short story for the permafree compendium. For myself, I also have a WIP called Awakening, set to come out in November—which is my twist on Angels. So, you’ll see a world-bridge between my current WIP Oracle and Awakening happening in the boxed set I just mentioned. The Angels and Magic novella will be about one of the side characters in Awakening, and her interaction with Diana (the oracle) before the story of Awakening begins. In addition to fiction, my first nonfiction book just came out in March, called Author Impostor. It’s a writing and psychology book helping fellow authors get over impostor syndrome and get on with writing. It’s available now at Amazon! As well as writing, I’m also a graphic designer. Art is totally in my blood. So, I like to fiddle with book cover ideas, social media posts, as well as mixed-media art. Pastel painting is one of my favorite non-tech related mediums. Fun fact: I studied Reiki in the early 2000’s and have my Reiki Master certification. Right now, I’d have to say AMS ads—but that’s because I’m currently in the learning phase. I’m reading (in addition to the Lux series), Brian Meeks’ book, Mastering Amazon Ads. In this day and age, it’s become increasingly difficult to get yourself noticed, but AMS can certainly give authors like me a leg up. Everywhere. Anywhere. At the moment, it’s super cold and dark here in Minnesota. So if it’s warm and sunny, send me there. In all honesty—I love to travel, so I can’t pick a single favorite to go. I would love an adventure of any kind. Thanks for letting us get to know you a bit better. I don’t read dystopian very often, but Runa slipped under my skin before I knew it and now I can’t put it down! If you’d like to dive into The Pendomus Chronicles, you can find links to all three books below. Thanks for coming on! I loved getting to know the author behind the books!